Hudson Chiropractic – Our Scottsdale chiropractic office near Old Town Scottsdale provides a whole-body approach for corrective treatment of neck, middle and low back pain, migraines, headaches, muscle pain, numbness and tingling of your arms or legs, and sciatica. As careful as you may be, these injuries can result from repetitive motions, compensation of muscle imbalances, car accidents, work injuries, sports or even simply bending over to pick up a pencil. We are here to help you! NEW TO THE AREA? If so, we can contact your prior doctor’s office and request for your records to be transferred to help continue your care. AFFORDABLE AND STRESS FREE CARE! We are on many insurance plans and also offer affordable time-of-service rates. There are no surprise fees. In fact, we can help you verify your insurance coverage. We’ll communicate directly with your insurance carrier and attorney (if involved in a case) to ease your stress. ONE TREATMENT PLAN DOES NOT FIT ALL. We listen, and create with you a specific treatment plan comprised of advanced techniques & testing in chiropractic and physical medicine modalities and therapeutic procedures (formerly referred to as physiotherapy), cold laser therapy, massage, core strengthening, and nutritional support to boost your health to optimal levels. MINIMAL WAITING. You will be pleased that we make every effort to keep your waiting time for treatment at a minimal. Giving you more time to do the things you love and enjoy! Within our website you will find details of our cost effective services, New Patient instructions, contact information, and answers to the most frequently asked questions within our office. Thank you for choosing Hudson Chiropractic as your Scottsdale chiropractor to support your ACTIVE HEALTHY LIFESTYLE. See you soon! I have spent a majority of the last decade suffering from chronic lower back pain and spontaneous back spasms that have affected my efficiency at work and deteriorated my athletic performance. Your team treatments and advice has helped me to live without back pain. Thank you for helping me improve the overall quality of my life. 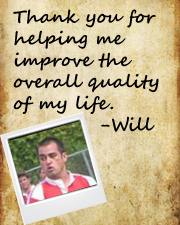 – Will M.